England have been placed in League A's Group 4 with Spain, visitors to Wembley on Saturday, and Croatia.Wales and the Republic of Ireland, drawn in League B's Group 4 with Denmark, meet in Cardiff on Thursday for their first game in the competition.Northern Ireland, also in League B, begin at home to Bosnia-Herzegovina on Saturday in Group 3, and will be up against Austria in their section too. Scotland, placed in League C's Group 1, open against Albania in Glasgow on Monday, before visiting Israel in October.Not all of the nations competing will see the competition in the same way. 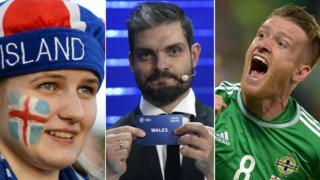 England, Wales and Northern Ireland might baulk at the idea of needing a back-door route to Euro 2020, given all three were at the finals in France in 2016. But would they all be entirely confident of finishing in the top two places in a five- or six-team group to earn qualification in the usual way?The Scottish FA is being more circumspect. With its focus sharpened by Hampden hosting four Euro 2020 tournament matches, it is selling Uefa's new competition - one which will effectively replace most international friendlies - to sceptical fans as a way of ending what would be a 22-year absence from major finals.The reasoning? The fact that two of the bottom 31 teams in the 55-nation European rankings are now guaranteed qualifying slots.The draw for the inaugural Uefa Nations League took place in Lausanne in January and is, according to Uefa's head of competitions, "different, not complex". What about this being a back door to the Euros? This is where things start to get a little bit tricky.The actual qualification process for Euro 2020 has been simplified, with the top two nations in the 10 groups claiming a place in the finals. The seedings will be determined by how teams performed in the preceding Nations League and the 10 fixtures will be wedged into an eight-month window from March-November 2019. So far, so familiar.However, that leaves four places at the finals - which will be held in 12 host cities around the continent - still to be filled, which is where the fun starts.Remember those Nations League groups? The four group winners in each tier will then play-off in March for a first crack at claiming one of those four vacant spots. [/i] but the Nations League should end that practice. "The more matches played in competition makes it all the better," said Marchetti. "Clearly there is more harmonisation as all the teams will play roughly the same number of games, without a free choice of opponent. "And these finals are not an add-on to the calendar. They are on dates that are currently on there. We are not asking more sacrifice of the players, they will simply play something else." So why else are we doing this? Uefa is concerned by the relative strength of the club game and sees this as a means to redress the balance. But, perhaps more importantly, broadcasters have committed to a package that runs until 2022. Who wouldn't watch Germany playing Spain in a competitive final in an otherwise fallow football summer?There have even been murmurs that Fifa is enthused enough by the plans to be considering a global equivalent.But in reality, the changes will have little real effect on the top-tier nations - save a handy safety net should they mess up qualification - as their glamour friendlies are simply replaced with a more codified competition against the same elite countries. But for those for whom qualification is a dream rather than an expectation, this provides a significant glimmer of hope. "It is a new competition and like every newborn it takes time to establish itself, settle down and be recognised, but we think we have good ingredients for success," said Marchetti. "This will turn most of the friendlies into competition matches and that will be a much better proposition for fans." » Nations League: The back-door route to Euro 2020?